Hokkaido is considered by many to be the final frontier for the outdoors in Japan. What better way to experience the outdoors than ice fishing. 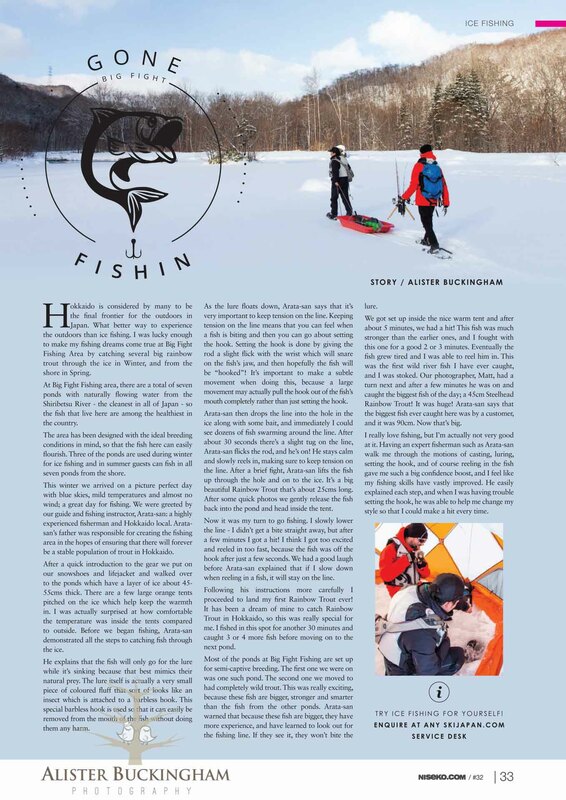 I was lucky enough to make my fishing dreams come true at Big Fight Fishing Area by catching several big rainbow trout through the ice in winter, and from the shore in spring. At Big Fight Fishing area, there are a total of seven ponds with naturally flowing water through them. The river that flows through this area is the Shirebetsu River. This is river is the cleanest in all of Japan, so the fish that live here are among the healthiest in all of Japan. The area has been designed with the ideal breeding conditions in mind, so that the fish here can easily flourish. Three of the ponds are used in the winter time for ice fishing and in summer time guests can fish in all seven ponds from the shore. This winter we arrived on a picture perfect day with blue skies, mild temperatures and almost no wind; a great day for fishing. We were greeted by our guide and fishing instructor, Arata-San: a highly experienced fisherman and Hokkaido local. Arata-San’s father was the one who created the fishing area in the hopes of ensuring that there will forever be a stable population of trout in Hokkaido. After a quick introduction to the gear we put on our snowshoes and lifejacket and walk over to the ponds which have a layer of ice about 45-55cm’s thick. There are a few large orange tents pitched on the ice which will keep us warm. I was actually surprised at how comfortable the temperature was inside the tents compared to outside. Before we began fishing, Arata-San demonstrates all the steps to catching fish through the ice. He explains that the fish will only go for the lure while it’s sinking because that best mimics their natural prey. The lure itself is actually a very small piece of coloured fluff that sort of looks like an insect which is attached to a barbless hook. This special barbless hook is used so that it can easily be removed from the mouth of the fish without doing them any harm. As the lure floats down, Arata-san says that it’s very important to keep tension on the line. Keeping tension on the line means that you can feel when a fish is biting and then you can go about setting the hook. Setting the hook is done by giving the rod a slight flick with the wrist which will snare on the fish’s jaw, and then hopefully the fish will be on! It’s important to make a subtle movement when doing this, because a large movement may actually pull the hook out of the fish’s mouth completely rather than just setting the hook. Arata-San then drops the line into the hole in the ice along with some bait, and immediately I could see dozens of fish swarming around line. After about 30 seconds there’s a slight tug on the line, Arata flicks the rod, and he’s on! He stays calm and slowly reels in, making sure to keep tension on the line. After a brief fight, Arata lifts the fish up through the hole and on to the ice. It’s a big beautiful Rainbow Trout that’s about 25cm’s long. After some quick photos we gently release the fish back into the pond and head inside the tent. Now it was my turn to go fishing. I put the line into the hole and lower it down slowly, remembering Arata’s earlier instructions. I didn’t get a hit straight away, but after a few minutes I got a hit! I think I got too excited and reeled in way too fast, because the fish was off the hook after just a few seconds. We had a good laugh before Arata explained that if I slow down when reeling in a fish, it will stay on the line. A few minutes later and I was on again! This time I was determined to land the fish. I slowly and carefully watched the line and made sure to keep tension on it, and after a fight that lasted 30 seconds I landed my first Rainbow Trout ever! It has been a dream of mine to catch Rainbow Trout in Hokkaido, so this was really special for me. I fished in this spot for another 30 minutes and caught 3 or 4 more fish before moving on to the next pond. Most of the ponds at Big Fight Fishing are set up for semi-captive breeding. The first one we were on was one such pond. The second one we moved to had completely wild trout. This was really exciting, because these fish are bigger, stronger and smarter than the fish from the other ponds. Arata warned that because these fish are bigger, they have more experience, and have learned to look out for the fishing line. If they see it, they won’t bite the lure. We got set up inside the nice warm tent and after about 5 minutes, we had a hit! This fish was much stronger than the earlier ones, and I fought with this one for a good 2 or 3 minutes. Eventually the fish grew tired and I was able to reel him in. This was the first wild river fish I have ever caught, and I was stoked. Our photographer, Matt, had a turn next and after a few minutes he was on and caught the biggest fish of the day; a 45cm Steelhead Rainbow Trout! It was huge! Arata says that the biggest fish ever caught here was by a customer, and it was 90cm. Now that’s big. I really love fishing, but I’m actually not very good at it. Having an expert fisherman such as Arata-San walk me through the motions of casting, luring, setting the hook, and of course reeling in the fish gave me such a big confidence boost, and I feel like my fishing skills have vastly improved. He easily explained each step, and when I was having trouble setting the hook, he was able to help me change my style so that I could make a hit every time. Make your fishing dreams come true with Big Fight Fishing; I certainly did! Big Fight Fishing can be booked at SkiJapan.com Front desk. Please contact SkiJapan.com for details.